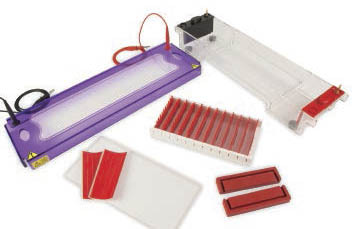 The multiSUB™ Midi 96 Gel System is ideal for high throughput electrophoresis of PCR products or samples containing a small number of DNA bands. 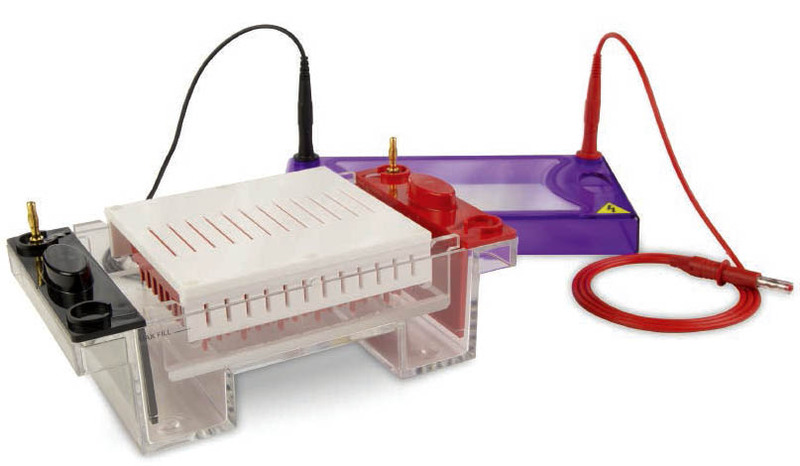 Its 10x12cm (W x L) gel dimensions and 96-well comb block format correspond to the standard microplate configuration. Two different types of comb are available: one which has 8 wells and one additional lane for DNA markers and one which has 8 wells and 2 additional lanes for markers. The offset layout of the wells allows a maximum run length of 1.8cm per well, resulting in improved separation. The multiSUB™ Midi 96 can accommodate samples from a 96-well plate – samples can be loaded directly using 8-channel pipettes. As with all multiSUB™ units, leak-proof casting is simplified using the supplied casting dams while their ultra-compact size minimises buffer usage and bench space requirements. MSMIDI96ST Stretch Systems are also available for those users requiring an extended run length per well of up to 3.6cm, or for loading of samples from two 96-well plates - MSMIDI96STDBL. 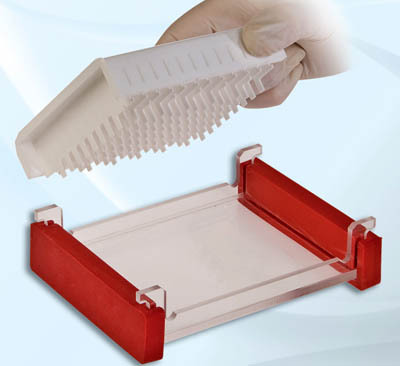 Each unit delivered complete with UV tray, casting dams, comb block with 12 sample combs each with 8 samples. Choose comb thickness 1mm or 1.5 mm and marker lanes 1 or 2.